As far as time pieces go, the modern world is dominated by digital gizmos which can hardly be called watches as they functionality goes way beyond time telling. However, the tradition of mechanical watches has not yet been lost. Furthermore, the value of old fashioned time pieces has not diminished over the years. On the contrary, there are numerous mechanical watches that are worth a lot more than the most sophisticated digital watches. Calibre 89 is considered to be the most complicated watch in the world. It is a handcrafted time telling jewelry with over 30 functions. The Calibre 89 is not a single watch. 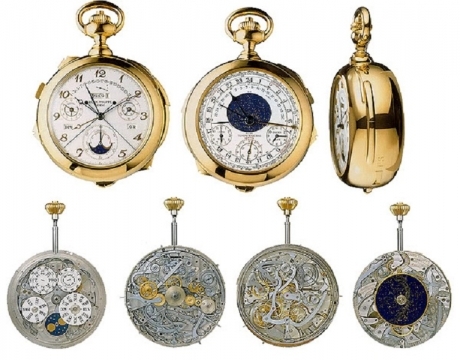 It is a commemorative series of four golden watches that are so valuable that they should only be worn by royalty. The series was created in order to honor the 150 years anniversary of the renown Patek Philippe company. The watches come in yellow gold, white gold, rose gold, and platinum. They were designed in the early 80s and the whole creation process was made by hand. It was completed in 5 years with the help of five engineers using all the mechanical watchmaking techniques accumulated over 1500 years. The most complicated watch is larger than an average pocket watch but still small enough in order to be worn without problems. With a width of 3,5 inches, a thickness of 1,3 inches and a weight of 2,5 pounds, the Calibre 89 contains not less that 1728 components. Among its most important components are the 24 hands, the eights disks, the thermometer, the two dials and the star chart. Given the wide variety of components, you can only imagine that the most complicated watch in the world has many peculiar functions. The most interesting of the 36 functions are: the moon phase display, the leap year indicator, the 12 hours recorder, the power reserve, the thermometer, the sunrise and sunset time, the star chart, the sun hand, the tourbillon regulator, the date display, the date of Easter and the equation of time. As you can see, the Caliber 89 is an example of the exquisiteness of Swiss watches. It is a testament to a long lasting tradition of handcrafting mechanical watches. There are many aspects that contribute to the evaluation of the Calibre 89. Not only is this the most complicated watch in the world but it is also beautifully handcrafted and quite exclusive, considering the fact that only 4 models were created. The exquisite time piece was evaluated at about 6 million dollars and it is one of the most expensive mechanical watches in the world.